I was thrilled to see a few native plants re-emerging in my hillside garden upon the removal of the last of the smothering ivy and invading broom and black-berries. Most have been annuals, whose seeds may well have lain patiently under the ivy for a couple of decades; none of them were particularly exciting, but they served a purpose. Pearly everlasting (Anaphalis margaritacea) was the first to appear; admittedly cosmopolitan in its distribution, it is actually listed in A Flora of San Francisco as belonging here, even in my own neighborhood. Its silvery foliage is attractive and the tiny flowers provide nectar for the smaller beneficial insects. Equally widespread is American vetch (Vicia americana), whose roots, I hoped, would help fix nitrogen in the soil. I had set aside the topmost part of the hill for San Franciscan native plants—those that might have been found here in the San Miguel Hills before Europeans settled. I tucked in small plants of ceanothus, zigadene (Zigadenus fremontii), iris (Iris douglasiana and I. longipetala), and various grasses, all propagated from remnant local populations by the Yerba Buena Chapter of the California Native Plant Society for their annual November plant sale. I hoped that the common brodieas (Dichelostemma capitatum) and soaproot (Choragalum pomeridianum) that flowered so beautifully in the adjoining grassland would spread into my garden. I’m still waiting. Then I noticed a few plants of miner’s lettuce (Claytonia perfoliata) along the upper pathways. I’ve always enjoyed miner’s lettuce when encountered on hikes, usually along moist trails; the patterns created by the simple elliptical shape of its basal leaves and the disk-like shape of the perfoliate stem leaves never fail to catch my eye. Since it is native to San Francisco, I thought a few would be good. 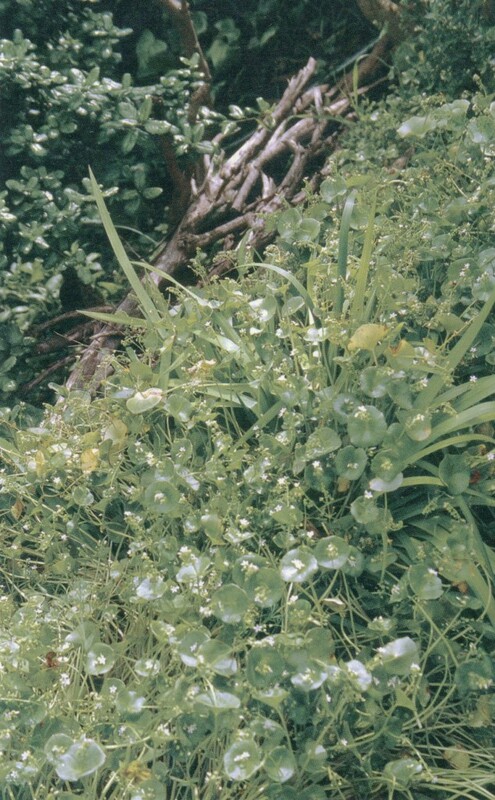 In the following year, a few more plants of miner’s lettuce appeared. And then came the winter rains of 2004-2005. My hillside is anything but moist—except in an unusually wet winter. I noticed the distinctive pattern of tiny seed leaves appearing everywhere along the paths, in the terraced beds, and on slopes too steep to mulch. This would be a banner year, I thought. Along the paths, with their compacted, rocky soils, the plants remained small, but in the beds, they rapidly grew to a height of twelve to fifteen inches; the perfoliate leaves reached almost four inches in diameter. With each rain, the plants expanded in size and began to overwhelm young plants of ceanothus, manzanita, iris, and even otherwise aggressive native annuals, such as California poppies and clarkias. It never occurred to me that such a benign plant would become a problem, but a quick look at The Jepson Manual revealed the true nature of miner’s lettuce: “INV”—the code for invasive! It was time to remove it. Three hours later, I had filled one and a half thirty-gallon paper trash bags with miner’s lettuce—far more than my compost bin could hold—from only the top two hundred square feet of the garden. More would come out later. The poppies and clarkias began to straighten up, and the smaller shrubs saw the sunlight again. I thought about the time and energy needed to remove this simple native annual, with its miniscule root system, from such a small area. If it took this much effort here, imagine what it must take to remove truly aggressive weeds like broom, pampas grass, ivy, and blackberry that have invaded natural areas along thousands of miles of the West Coast. Is it even possible to get the upper hand on these thugs? The magnitude of the task is incomprehensible. We may be stuck with them forever. What about all the new plants appearing in our nurseries? Could any of them be the next invasive exotic somewhere in the West? Is it realistic to expect that even our best nurseries have the time and resources to test their choice new introductions under the array of soil and climate types in which they will ultimately be planted?